The federal government has accused the presidential candidate of the Peoples Democratic Party (PDP) in the just concluded general election, Alhaji Atiku Abubakar, of overheating the polity by planning to replicate the Venezuelan model in Nigeria, following media report that he has hired a United States’ lobby firm to convince the US not to recognise the re-election of President Muhammadu Buhari until the Supreme Court has ruled on the suit. But in a swift reaction, the National Working Committee (NWC) of the PDP said that no amount of fabrications, attempt at set-up; as well as veiled and open threats by the All Progressives Congress (APC)-led federal government would stop Atiku from reclaiming his mandate at the tribunal. 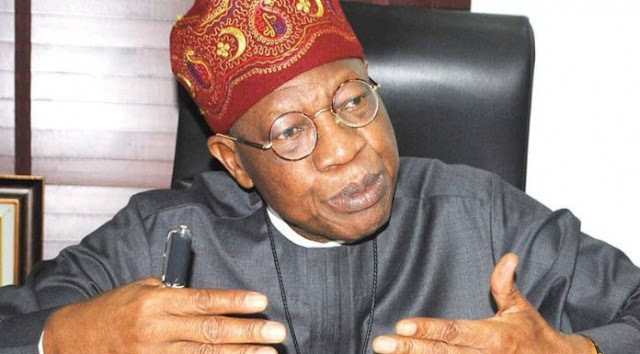 The Minister of Information and Culture, Alhaji Lai Muhammed, while addressing a press conference in Abuja, Thursday, claimed that the federal government was aware of media reports that Atiku had on Wednesday distanced himself from the posters that are circulating in Abuja, while also denying hiring US lobbyists, claiming tongue-in-cheek that the APC fabricated it. The minister noted that if the media reports of denial were right, it means that the former vice president had suddenly realised the grave implication of his actions, hence he had decided to beat a quick retreat before it is too late. Muhammed added that Atiku, as a self-avowed democrat, should realise that the only lawful channel for challenging the result of an election is through the courts, rather than resorting to self-help, as he seems to be doing now, describing it as an act of desperation, while warning that the consequences are dire. The minister stated: “The posters and the hiring of US lobbyists, the latest of such by the PDP candidate, have triggered questions about what Alhaji Abubakar is up to. Is he starting a fresh campaign after the elections have been won and lost? “Has he rescinded his decision to challenge the results of the presidential election in court, perhaps after realising that the results he claimed to have obtained from the INEC back server are cooked? Is he now going for self-help? What really is Atiku’s motive? The minister stated that the president’s victory was well deserved, adding that at a different forum, it represents the triumph of the ordinary Nigerians over the elite. The minister stressed that Atiku has the right to do whatever is lawful to challenge the outcome of the election, but stressed that he could not get through the back door what he couldn’t get through the front door, saying that would be a pipe dream. Muhammed stressed that Atiku would not be the first or the last person to lose an election, and that he should realise that losing an election is not the end of the world. He said that while he has challenged the result of the election in court, he should not give the impression that he does not have confidence in the judicial process, which is what resorting to self-help implies. “He should stop overheating the polity and quit trying to instigate a political crisis in Nigeria. No citizen, no matter how highly placed, is above the laws of the land. Enough is enough!,” he warned. Meanwhile, in a statement Thursday by the National Publicity Secretary of the PDP, Mr. Kola Ologbondiyan, the party said that such orchestration are also targeted at instilling fear, cause apprehension in the citizenry and create opening to further suppress genuine public opinion and the course of justice in the quest by Atiku and the PDP to restore the will of the people. The PDP rejected in its entirety, the declaration by the Buhari presidency that Atiku is “lucky to be walking free,” noting that such was inciting and brings to the fore the unwholesome intention of the APC-led administration against Atiku for seeking to retrieve his stolen mandate at the court. Ologbondiyan added that part of the motive is to use lies, fabrications, threats and sponsoring of Atiku campaign posters to portray Atiku and the PDP as being desperate and ready to subvert the rules in the pursuit of his mandate; and by so doing discredit the party’s candidate in the eyes of the judiciary and the public in general. PDP stated: “The series of orchestrations against Atiku Abubakar and the PDP by agents of the federal government, officials of the Presidency and the Buhari Media Organisation (BMO), expose a well-coordinated plot, which includes a resort to unfounded claims of links with a foreign lobby group, to attempt to frame Atiku Abubakar, cause tension and ultimately derail the recovery of the stolen mandate at the presidential election tribunal. The main opposition party said it was instructive to state that the party and Atiku do not need any foreign lobby group to prove their case before the tribunal as Nigerians themselves have been at the forefront of this pursuit, especially with the overwhelming evidence before the court. The party cautioned the APC-led federal government to allow the tribunal to judiciously carry out its responsibilities without let or hindrance as well as stop their unrelenting plots to overheat the system and derail the course of justice as such will all come to naught. “Nigerians now know who to hold responsible should any harm come to Atiku Abubakar, his family or any member of the PDP Presidential Campaign Organisation (PPCO) in the course of the pursuit of the mandate at the tribunal,” the party said.